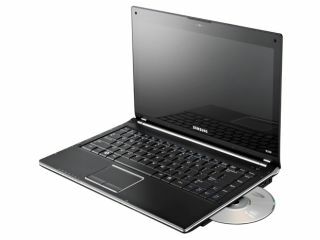 The folks at What Laptop have been lucky enough to get an exclusive hands-on with Samsung's latest laptop, the Q320. Although they haven't had the opportunity to benchmark the machine – which we reported on back in March – the 'Centrino 2 powered' portable computer seems to have made something of a lasting impression. Of note is the computer's screen. The 13.4-inch 1366 x 768 display goes right to the edges and, as it is 16:9, watching movies on it is a must. The What Laptop reviewer was also impressed with the design of the computer, saying that "the plastics are all tough and a matt finish gives it a tactile feel." They also noted that the Q320 "looks like an ideal choice for the portable worker." The Samsung Q320 is out now and costs around £670. For more on it, point your browser to WhatLaptop.co.uk.